Right from the start you know this is going to be a good read. A faux 19th century big baggy monster set in an exotic location. It reminded me very much of the awesome David Mitchell of Cloud Atlas and Jacob de Zoet fame. How can a 27 year old produce such a mature, luscious, intriguing story, rich in social detail and human insight. It's long though, because of the constant repetition involved with so many characters going through the same discovery process around the same set of incidents. This means regular recounting of the story to remind the reader what's taken place previously. It's really not that complicated a plot, centered around a gold heist, but flesh is added to the bones progressively, and by the end it's become a rich and satisfying feast indeed. Most of the 12 luminaries also suffer from extreme verbosity, and there are plenty of back stories. So we're faced with a novel of 832 pages, and one that demands close reading and concentration. As well, Catton has a habit of subjecting all her characters to lengthy psychological assessments. Here I think she's trying a bit too hard. It becomes somewhat claustrophobic and burdened by detail but nevertheless it does deftly convey in microcosm the moral, social, economic and political pressure points of a small but thriving mid-19th century community. 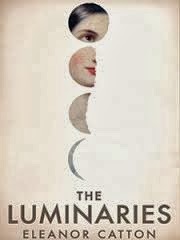 The luminaries, eminent citizens, are a fascinating, representative mix - one even a whoremonger, another an opium dealer. I enjoyed this absorbing novel immensely. It's quite magnificent. Of all the novels shortlisted this deserves to win the Booker. If the judges give the prize to sentimental favorite Jim Crace's rather lightweight Harvest, then the Booker deserves to be swamped by Americans in the future. I couldn't put this book down. From the first page, I was hooked on the characters and the mysterious events that brought them together.